History (H. Chennaoui-Aoudjehane): On December 20, 2008, witnesses from a number of locations in Morocco (Agadir, Marrakesh, Ouarzazate) observed a meteor with a W to E trajectory. According to the local newspaper, Al Massae (of December 27th), people from the high Atlas Mountains (between Marrakesh and Ouazazate) heard a sound and felt an aftershock. Due to the high relief in this mountain region, covered with snow at this time of the year, searching for the meteorite was a difficult task. 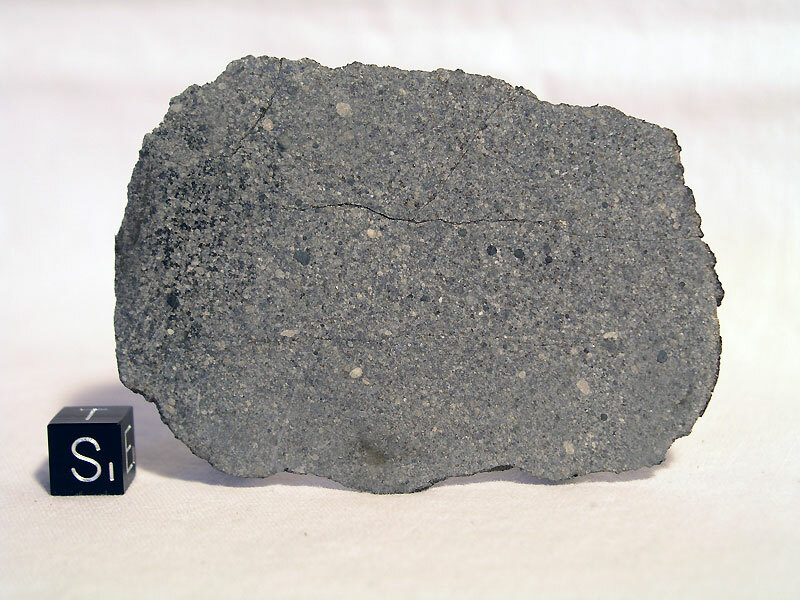 The first reports on finding pieces of a meteorite came a couple of weeks later. The largest impact pit is located near Oued Aachir (1.10 m diameter and 70 cm depth, 31°09.8′N, 7°00.9′W), with a stone exceeding 30 kg and many small fragments. A second one is smaller, (about 20 cm diameter and 10 cm depth; 31°09.9′N 07°02.3′W) located 2 km W from the first one; the main mass from the second impact was probably about 500 g. Nine new impacts coordinates have been reported by S. Buhl and M. Aid, and P. Thomas reported 3 other impacts. A strewn field of at least 25 km long and 2 km wide has been outlined. Physical characteristics: Total weight is presently estimated to be 100 kg. Pieces recovered as of February 15, 2009, are 30 kg, 1.5 kg, 3.8 kg, 3.69 kg, 2.4 kg, 1.5 kg, 1 kg, 800 g, and 399 g. One major fragment of 1.7 kg and many small pieces from the same stone (ranging 500 to below 1 g) were also recovered. The largest fragment shows a nearly complete dull gray fusion crust, other pieces are 90% crusted to free of crust, often broken along preexisting fractures. Thick fusion crust, locally more than 1 mm. Petrography (Albert Jambon, Omar Boudouma, D. Badia UPVI and M. Denise, MNHNP): Abundant chondrules with visible but not well-delimited outlines. Chondrule size is 0.1 to 1.5 mm. Dominant olivine and orthopyroxene. Abundant chromite, rare clinopyroxene and ilmenite. 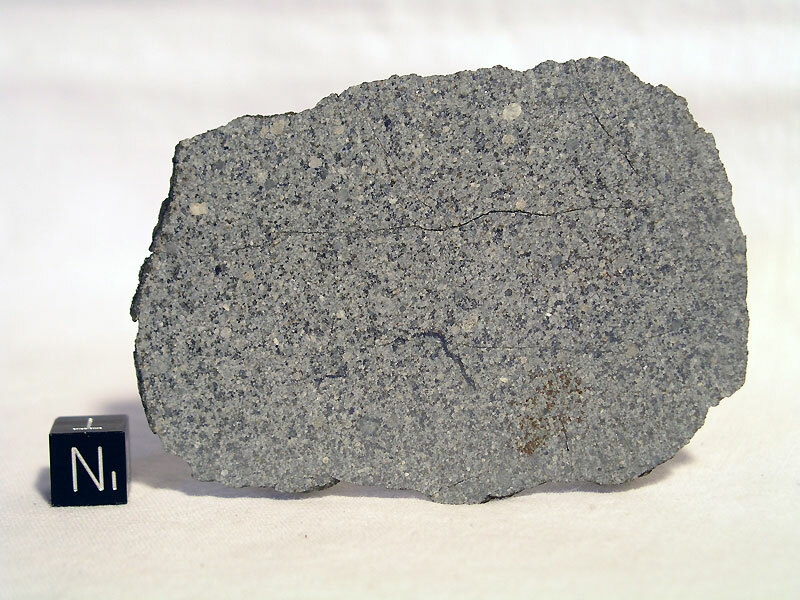 Numerous pockets with chromite, plagioclase and phosphate (merrilite and Cl-apatite). Kamacite, with deformed Neumann bands, and taenite, twinned troilite. Copper. Mode: metal+troilite 10%. Mineral compositions and geochemistry: log χ = 5.3. Olivine Fa18 ± 0.5 Opx = En83 Fs16 Wo2 Minor calcic pyroxene. Plagioclase is Ab83–86 An5–15 Or7–2. Ca-phosphate (merrillite and Cl-apatite). Chromite: Cr# (100× molar Cr/[Cr + Al]) = 82. 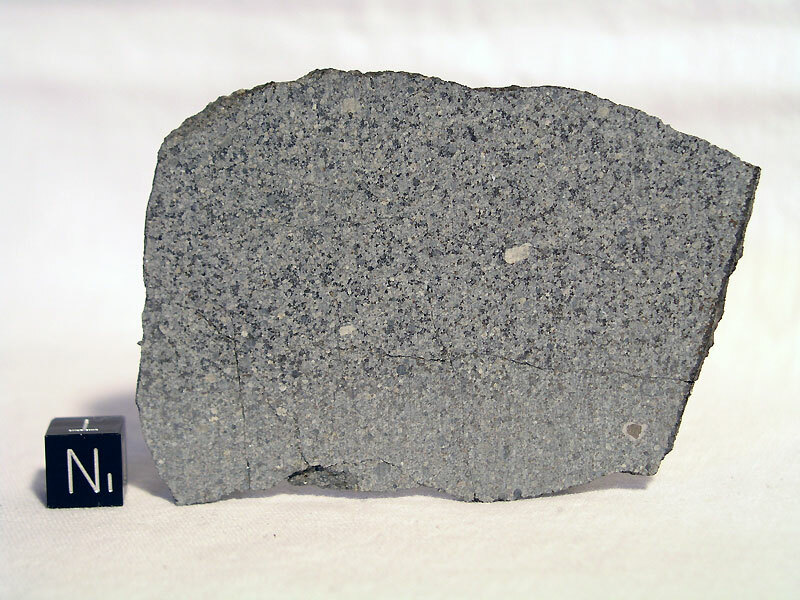 Metal: kamacite with 5% Ni and taenite with 36–47% Ni. Oxygen isotopes (C. Suavet, J. Gattacecca CEREGE): δ17O = 3.26‰, δ18O = 5.01‰, and Δ17O = 0.65‰. Magnetic susceptibility is log χ = 5.3 × 10–9 m3/kg. Classification: Ordinary chondrite (H5), S3, W0.